In this drill there are 4 offensive players and 3 defensive players. Offense sets up in a Box, and whenever Possible O1 and O2 should be left handed. If you only have one lefty in the drill he should go down to O1. It does not make sense for lefties to play at O3 or O4 unless you have more than 2 lefties in the drill (not likely). If O1 has to play right handed, he should work on getting higher above goal line extended so that he is a threat to shoot. In the above diagram, the ball is starting at O3. Therefore D1 plays the ball (from the inside). D2 and D3 then cover the next 2 biggest threats which are the lower 2 offensive players. They should play inside their men and shade/be prepared to make a slide on the first pass. The Player that starts with the ball passes across to the other top guy (only open guy at the beginning). His only other option would be to pump fake across eliciting a slide, and making a skip pass to the opposite low corner, but that should not happen!! The ball is moved as quickly as possible trying to get an good shot from 10 yards or in from any of the 4 players. The offensive players will not be changing positions, but will be moving 4-5 yards in any direction to maintain an open passing lane and get a good feed or shot. The drill can start at either of the top positions, and the offense should designate where the ball is by raising his stick with the ball in it. The coach should also designate “Ball is Top Left” for O2 and “Ball is Top Right” for O3. The Top defender gets in position of the player with the ball and the drill starts. Once the ball is missed or hits the ground, the repetition is over and another should start with the ball up top again. Rotate players every couple of repetitions. Low men need to stay in passing lanes. This means when the ball is with O3, low man O1 should be tight to the crease and Low man O4 should be wide. As the ball moves across to O2, O1 should get wide and O4 should crash the back side of the crease. This allows them to stay in the passing lane in the open space between D1 and D2 as they are making their slides. Ultimately we are looking for a skip pass which completely messes up the defensive slides. 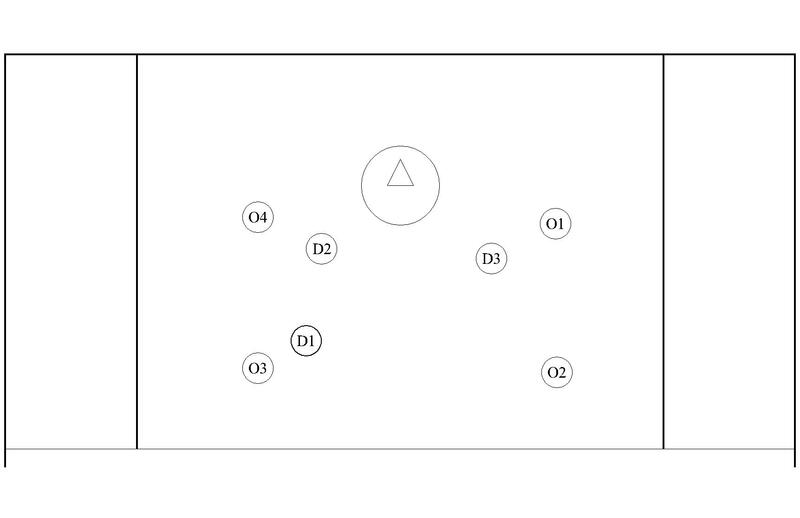 A Skip pass is a diagonal pass through the box, either from high to low or low to high. Players need to learn to “Pre-Read” the defense before receiving the pass. This means instead of just watching the ball move around, he needs to be able to see the defenders and know if he has a skip pass opportunity before he receives the pass. If that is not possible he should immediately move the ball to the only open man which is usually the player he received the ball from. Usually players catch the ball, then look at the defense, then make a decision and make the pass. During the time it takes to make those decisions, the defense has made its slide. Off ball players all need to shade towards their slide, but not allow a pass to their “check”. Players should shuffle into their slide instead of committing fully by running at the ball carrier. This allows them to recover if the ball is moved immediately. The only time to fully commit is when you know you will be able to break up the play on the particular catch. The idea is to make the offense make as many passes as possible to possibly make a bad pass. This is a great drill to end warm ups before games to get the players working on thinking and moving the ball as quickly as possible.